Yesterday hundreds of U.S. citizens who had come from all parts of the country peacefully, nonviolently sat on the steps of Our Nation's Capitol building to protest against the invasion of our democracy by plutocracy, a potentially lethal ailment. But they're fighting. Yesterday, 400 of them were arrested, handcuffed, bussed to police stations, forced to wait for hours in a long line (sound familiar? ), fined $50 each, and then let go. "Another world is possible/We are unstoppable," was the first chant I heard today (I couldn't be there yesterday because my bones break when police grab me--no kidding). The sun was shining, a gentle breeze was blowing, the trees were in full bloom, and the circa 100 people were mellow and smiling as I infiltrated their space. But first I broke police lines to take some photos before being told by mellow, smiling police to join the crowds. "Money out/Voters in!" was another chant. Each day of Democracy Spring will have a different theme. Yesterday was about politics. Today was dedicated to "elders," "our teachers." There were several in attendance, some holding folding chairs. One of them led us in singing Woody Guthrie's "This Land Is Your Land," but the "youngsters''' interest was quickly diverted. The median age was around 30. "Thank you!" was now a repeated chant extended to the elders. "Does this remind you of Occupy?" I asked one participant. "What's next? Will you continue through Election Day?" My answer was as hopeful as youth and the eternally young (boomers like me): The movement should expand in numbers and locations. "Money out/voters in!" rang out another chant. There were more varieties of chant than signs--artwork wasn't the point this time around. Message was. I noticed a man in a spiffy tailored suit among the jeans-clad crowd and had to go over to question him. "What's a suit doing here?" He was with two others, representing the group "The Most Influential Man in America," dedicated to routing "unlimited corporate spending in American politics." He handed me a million-dollar bill. I was reminded of the parodic group Billionaires for Bush, who attended anti-Iraq war events in tuxedos holding champagne glasses. I spoke with a North Carolinian who had migrated from Arizona, a former (recovering?) government employee. He'd had no trouble voting as a middle-class white, he noted sardonically. He had known AUDIT-AZ (election integrity) activist John Roberts Brakey in the Grand Canyon State. In North Carolina, companies were leaving because of the draconian legislation taking over, not just in the realm of stringent voter requirements that leave out the "usual suspects," those unable to produce picture IDS like driver's licenses or passports. Who among the underprivileged classes has either one? Two senior women I spoke with, from Wilmington, Delaware, delawaregetmoneyout.com, said that their activist interests spanned the realm of progressive issues, including GMOs, the environment, "quality of life for people," "all causes." Their state had attempted to add a constitutional amendment requiring the end of the Citizens United poison that is daily, gradually, sadistically increasing its chokehold. 70 percent of Americans want to get rid of Citizens United, they said. "Nothing will change until we get money out of politics!" I met an Apache named Rain from western Texas, "Apache land." He said he didn't want to be identified as a Native American, just an Apache. Another former former government employee, a defense contractor for Northrop Grummond and Lockheed Martin told me he had "lived his life asleep" until joining 99 Rise and marching from Los Angeles to San Francisco. He was one of the Democracy Spring marchers, identified by green bracelets, who had started out in Philadelphia and marched to DC, though he had joined up in Baltimore. "Amazing people!" he said of his group. Then he added that he was unemployed and would probably never get a job again after this participation. Another person had been among the Supreme Court 7 who had attended the hearing of the infamous 2013 McCutcheon v FEC case that had increased Citizen United's largesse to the top one percent so that individuals could donate even more to candidates than previously. He was still on probation for having stood up in the balcony and expressed his objections to more money pouring into politics, for all of one minute. Wow, what a feeling to break the silence of that sacrosanct place, he told me. A specialty police force was in charge. He and other outspoken colleagues were seized by an arm twisted behind them and hauled down to the "bowels" of the august building that hovered behind the rally today. They were interrogated and then taken to jail, to sleep with specialty cockroaches on what he described as a metal tray (!) and then released then next afternoon. U.S. v Bronstein is the name of the ongoing case. This man was again arrested yesterday but not penalized further for his participation. The more famous group was the Supreme Court 7, who had exhibited similar behavior while Citizens United was being argued. No wonder there is a special brand of police for SCOTUS. The chants were interrupted by another megaphoned voice proclaiming his love for Jesus, who he reminded us is coming back. Another person complained about the lack of mainstream media coverage. I managed to spot both CBS and ABC taking some footage and sound bytes. There was also a pair from a Netherlands TV station. When I asked them if they were here just for this event, they said no, they were traveling all over the U.S. to make a ten-part series on different aspects of this country. Dutch humor? I was told that Swedish reporters had also done some coverage. Said another woman, "I believe that we will win." 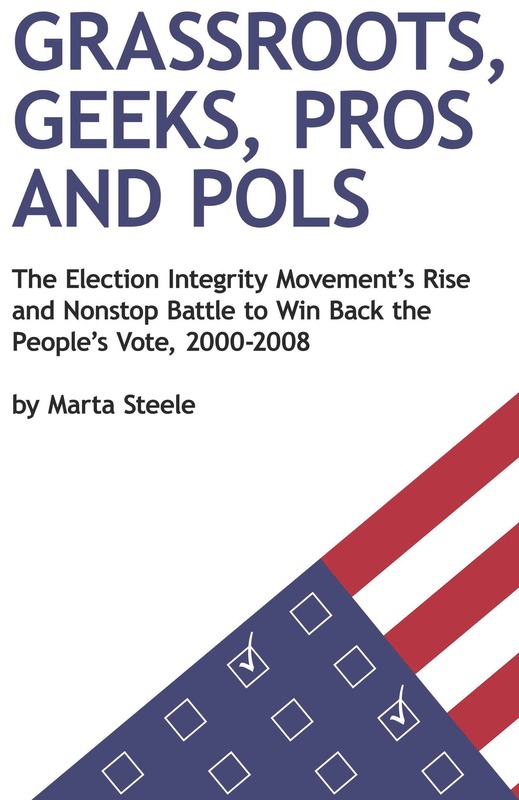 I was gratified by mention of the need for clean voting, a cause I have work on for years. A few signs proclaimed this. I wanted to stay all day. Everything was so beautiful and friendly and I had been transported into . . . what democracy looks like. A good answer to the refrain "Tell me what democracy looks like!" Too bad there were police barriers and a crowd of police next to the Capitol to "protect" it, as if that, and not the people, were in need of protection, and a lot more. "Money out of politics"/"Democracy will be the fix!"